It's no secret that owning a pet isn't cheap. They require medical attention, just like we do, and it can be a struggle sometimes to pay for it. Pet Health Insurance is becoming increasingly more popular because it allows pet owners to be able to afford more services for their pets that they might otherwise have not been able to do. 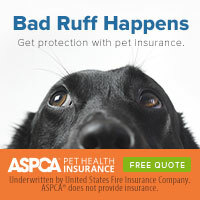 We think Pet Health Insurance is a great idea so below are the links to websites of insurance companies that some of our clients use. Check them out!